I’ve been looking forward to this weekend for weeks. Maybe even months. And now it’s over, even though it feel like it never really got started. My family has come and, unfortunately, gone. I have no idea where the time went. When we’re younger we have endless days with our families. In fact, it seems as if they will never end. We will never graduate high school and get to leave for the freedom of the dorms. We will never graduate college and be able to really make all our own decisions. And then it’s finally time for a little family separation. I have had over seven years of this, and I was happy to go home twice a year and host my family once or twice a year. And then I had a baby. Now I can’t get enough time with my family. We did so much this trip, it doesn’t seem like it should have gone by in the blink of an eye. We spent Friday in Maine, having lunch in Kennebunkport and shopping the outlet malls in Kittery. There was a walk on the beach Friday night with Justin and looking at all the stars we don’t get to see from Arlington. Saturday involved a 3.25-mile run, a nap with Robbie, a trip into Newburyport, a little lobster macaroni and cheese, and a terribly sad football game. Sunday was breakfast at Mad Martha’s, the craft fair at Harvard, a walk to the Charles with my brother, and a little time to start picking up the house. And the airport run. It was finally official that everyone had left and the weekend was over when I dropped my little brother off at the airport. I’d held it together pretty well when I said goodbye to the rest of the family, maybe because I knew I will see them at Thanksgiving. But I won’t see Hunter until Christmas. He kept assuring me it was only two months, but I happen to know that it’s actually two months and fifteen days. I didn’t realize the toll this weekend had taken on Robbie until I got home from picking up the dog at PetSmart (Did I mention that his grooming appointment was accidentally cancelled, which I didn’t realize until I called to check on his progress at 3:15? Not to worry… He’s clean and gorgeous!). 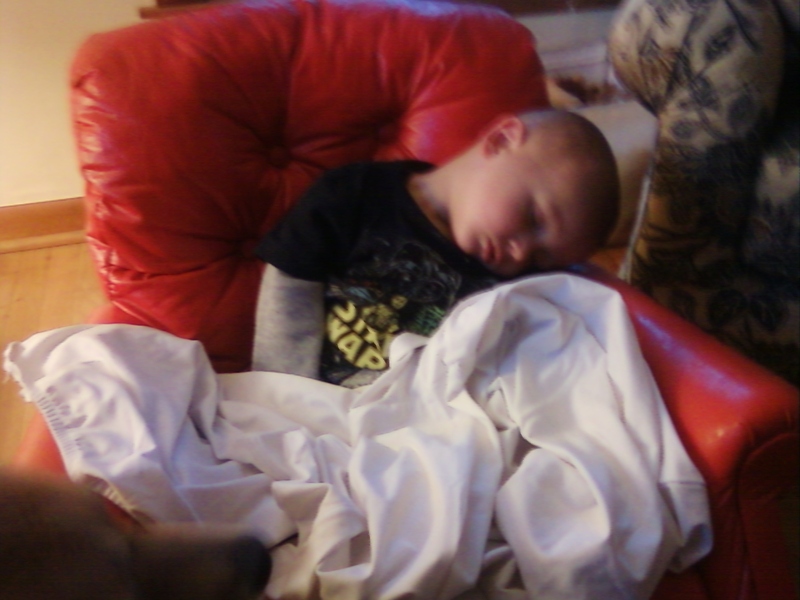 I found Robbie passed out in his recliner in a diaper and a Star Wars t-shirt. I’m sure Justin was so proud. As Hilary reminded me, there’s only 46 days until Thanksgiving. Here’s hoping we can make it.